Audits provide a rational framework for quality improvement by systematically assessing clinical practices against accepted standards with the aim to develop recommendations and interventions that target modifiable deficiencies in care. Most childbirth-associated mortality audits in developing countries are focused on a single facility and, up to now, the avoidable factors in maternal and perinatal deaths cataloged in these reports have not been pooled and analyzed. We sought to identity the most frequent avoidable factors in childbirth-related deaths globally through a systematic review of all published mortality audits in low and lower-middle income countries. We performed a systematic review of published literature from 1965 to November 2011 in Pubmed, Embase, CINAHL, POPLINE, LILACS and African Index Medicus. Inclusion criteria were audits from low and lower-middle income countries that identified at least one avoidable factor in maternal or perinatal mortality. Each study included in the analysis was assigned a quality score using a previously published instrument. A meta-analysis was performed for each avoidable factor taking into account the sample sizes and quality score from each individual audit. The study was conducted and reported according to PRISMA guidelines for systematic reviews. Thirty-nine studies comprising 44 datasets and a total of 6,205 audited deaths met inclusion criteria. The analysis yielded 42 different avoidable factors, which fell into four categories: health worker-oriented factors, patient-oriented factors, transport/referral factors, and administrative/supply factors. The top three factors by attributable deaths were substandard care by a health worker, patient delay, and deficiencies in blood transfusion capacity (accounting for 688, 665, and 634 deaths attributable, respectively). Health worker-oriented factors accounted for two-thirds of the avoidable factors identified. Audits provide insight into where systematic deficiencies in clinical care occur and can therefore provide crucial direction for the targeting of interventions to mitigate or eliminate health system failures. Given that the main causes of maternal and perinatal deaths are generally consistent across low resource settings, the specific avoidable factors identified in this review can help to inform the rational design of health systems with the aim of achieving continued progress towards Millennium Development Goals Four and Five. Devising strategies that measurably improve maternal and newborn care in low resource settings is an urgent global priority [1, 2]. Nearly 300,000 maternal deaths , 3 million newborn deaths , and 1 million intrapartum-related stillbirths , take place each year in grossly disproportionate geographic patterns. Given that there are many countries with very low childbirth-related mortality rates, it is clear that high childbirth-related mortality burdens are not inevitable. Rational bolstering of health systems saves lives, even in lower income settings where resources are limited. The major complications that result in maternal, newborn, and fetal deaths are well described. For mothers, these are traditionally categorized as excessive hemorrhage, infection, hypertensive disorders, and obstructed labor . For babies, these are intrapartum-related events (previously called birth asphyxia), infection, and complications of prematurity . Avoidable stillbirths are largely attributed to inadequate intrapartum care . These categories provide an important orientation to the general causes of childbirth-related deaths and as such are fundamental to establishing a basis for strengthening health systems. However, a limitation of these somewhat broad categorizations is insight into where exactly deficiencies in clinical care are occurring, information that is critical to the design and implementation of effective health system improvements. For example, a maternal death from hemorrhage can result from absent prophylactic oxytocin, undetected bleeding, and/or inaccessible blood transfusion capability—three different types of system failures that necessitate different intervention approaches to prevent failure recurrence. Targeted health system strengthening relies on a systematic analysis of the events that lead to deaths in order to determine if avoidable breakdowns in medical care are present. If such deficiencies exist, fully characterizing them and pinpointing precisely where in the clinical care continuum they occur provides clinicians, policymakers, and other stakeholders with information needed to effectively address them. Audits are tools that provide a logical framework for quality improvement by systematically assessing clinical practices against accepted standards . Mortality audits have demonstrated success in helping to reduce childbirth-related deaths in lower income countries [9–11]. Since the main causes of maternal and perinatal deaths are consistent across lower income countries, it stands to reason that there are also similarities in the avoidable factors associated with those deaths. Most maternal and perinatal death audits have been restricted to a single facility or region with no widely utilized centralized mechanism for aggregating data from across countries [12–14]. Up to now, the avoidable factors in deaths cataloged in these reports have not been comprehensively pooled and analyzed. We sought to identify the most frequently reported factors in avoidable childbirth-related deaths globally through a systematic review of all published reports of mortality audits in low and lower-middle income countries. Our main objectives were to identify those factors that repeatedly account for high proportions of avoidable maternal and perinatal deaths in individual audits as well as to identify the avoidable factors that contribute to the most deaths overall. Studies from low and lower-middle income countries were considered, using World Bank criteria for stratification of country by gross national income (GNI) per capita . Studies were eligible if they performed an audit of maternal or perinatal deaths using medical records, meetings of health workers, and/or interviews of health workers or patient families. Studies had to explicitly identify at least one avoidable factor in a maternal or perinatal death, and studies had to utilize definitions for maternal and perinatal deaths that were reasonably similar to those used by WHO. Maternal deaths are defined by WHO as “the death of a woman while pregnant or within 42 days of termination of pregnancy, irrespective of the duration and site of the pregnancy, from any cause related to or aggravated by the pregnancy or its management but not from accidental or incidental causes” . The perinatal period, as defined by the WHO, “commences at 22 completed weeks (154 days) of gestation and ends seven completed days after birth” . Perinatal mortality refers to stillbirths and newborn deaths in the first week of life . For the purpose of this analysis, a factor in an “avoidable death” was defined as one that was assessed to be directly related to the death; in other words, if the factor had been avoided than the death would probably not have occurred . Audits that did not report specific avoidable causes in maternal and/or perinatal deaths were excluded. Two investigators (HSM and JS) determined the eligibility of the articles independently and any discrepancy was resolved by a discussion between these two investigators. 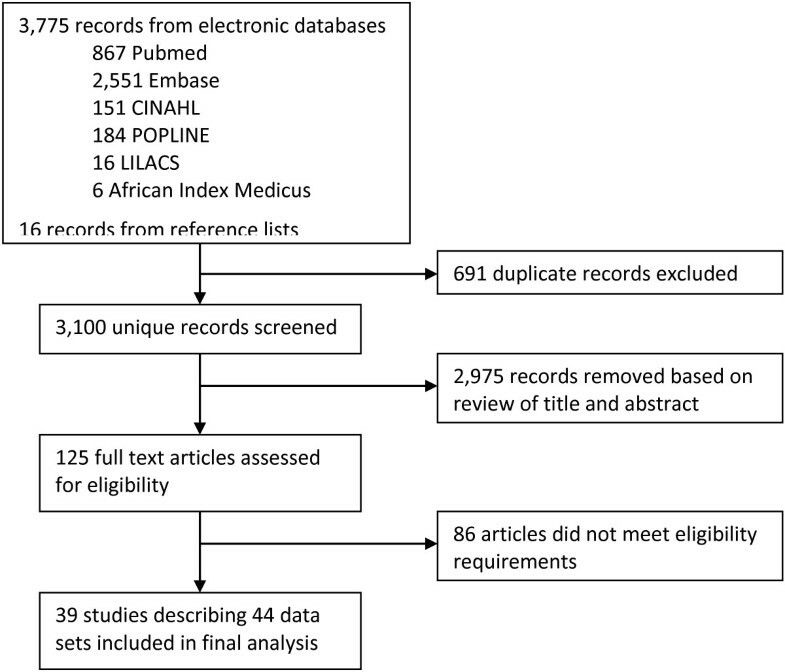 We performed a systematic search of published literature from 1965 to November 2011 in Pubmed, Embase, CINAHL, POPLINE, LILACS and African Index Medicus. The search strategy included various combinations of exploded and focused MeSH headings and keyword searching using the terms Perinatal, Maternal, Mothers, Neonatal, Newborn, Infant, Mortality, Audit, Clinical Audit, Death, Fatal Outcome, Avoidable, Preventable, and Developing Countries. A previously described “snowball” search strategy was also performed in which papers were identified through bibliographies of key studies . We also attempted to identify additional relevant studies, in particular non-published datasets, through queries to experts and international organizations concerned with maternal and perinatal health. Articles in all languages were considered and translated when necessary. Each article that met inclusion criteria was assigned a quality score in order to impose a weighing scheme according to the quality of the study. The score, developed to analyze the quality of obstetrical care in low and middle income countries , utilizes a numerical scale ranging from zero (lowest quality) to nine (highest quality). Calculation of the quality score was conducted by assessing the following criteria: selection of audit cases (maximum 3 points), quality control during the audit process (maximum 4 points), and reliability of the audit (maximum 2 points) (See Nine-point clinical audit quality criteria). Two investigators (HSM and JS) independently scored each audit by assigning one point for each criterion met by the article. If there was a discrepancy between the scores of the two investigators, the two scores were averaged to arrive at a final score. Nine-point clinical audit quality criteria adapted from Pirkle et al..
A meta-analysis was performed for each avoidable factor identified. First, we calculated the percent of studies where the factor was determined to be a cause of a maternal or perinatal death. Next, for those studies where the factor was determined to be a cause of death, a “pooled” or combined estimate of the percentage of deaths in those studies due to the factor was calculated. The pooled estimate was calculated using a weighted average of the estimates from the individual studies via accepted meta-analysis techniques [21, 22], in which the study is treated as a random effect. We estimated the weighted averages, confidence intervals for the weighted averages, and the variance of the random study effect using an iteratively reweighted least squares approach . The weights used in the iteratively reweighted least squares approach takes into account the sample size from each individual study, the variance of the random study effect, and the quality score of each study. This approach is semi-parametric in that is gives unbiased estimates regardless of the type of outcome variable (continuous, categorical or percentages). Finally, we determined the total number of attributable deaths for each avoidable factor. The study was conducted and reported according to PRISMA guidelines , (See Additional file 1). All analyses were performed using SAS/STAT 9.3 (SAS Institute, Cary, NC, 2011). The search returned 3,775 results and an additional 16 papers were added from reference lists. There were 691 duplicate entries and 2,975 were subsequently removed after abstract screening. The full texts of the 125 remaining articles were reviewed and 39 met inclusion criteria (Figure 1). These 39 studies included a total of 44 datasets since five studies included multiple datasets; one study included datasets from two different time periods , one study included datasets from two different countries , and two studies included datasets from both maternal and perinatal populations [24, 26]. Two other studies analyzed deaths from different time periods [27, 28] but the time periods were contiguous in these studies and so they were considered as one dataset each. We were unable to identify unpublished audits of maternal and newborn deaths that met inclusion criteria. Therefore, only published data were used. We summarized the datasets and categorized them by type of measure examined [24–62] (Table 1). Prospective interviews of antenatal care attendees combined with retrospective household surveys using verbal autopsy and medical records in 7 rural communities. Deaths occurred at home and in rural health facilities. D’Ambruoso L, Byass P, Qomariyah SN, et al. Jafarey S, Rizvi T, Koblinsky M, et al. Retrospective case record review from volunteer collected data, and a standard verbal autopsy questionnaire. Study included home and hospital deaths. Retrospective and prospective review of hospital records, village leader reported deaths, household surveys and antenatal clinic records at the community and hospital level. Verbal autopsy questionnaires were also used. Retrospective case record review at tertiary care hospital. Reviewed by committee of 3 consultants and 3 residents. Prospective case record review and regular maternal mortality review meetings at a district hospital. *2 calculations covering two different time periods within a continuous time period. Forty-four datasets were included in the study, comprising a total of 6,205 audited deaths. The majority of the datasets, 82%, came from African studies. Two datasets (4.5%) were from Pakistan [48, 61], two (4.5%) from Indonesia [25, 30], and four (9.1%) from India . Of note, the four datasets from India were obtained from the same investigation . The oldest dataset was from 1967  and the most recent datasets were from 2009 [47, 62]. Thirty-one of the 44 datasets (70.5%) examined maternal deaths while the other 13 datasets (29.5%) examined perinatal deaths. Study methods varied and there were an equal number of datasets that employed prospective methods (45.5%) as those that used retrospective methods (45.5%). Four of the datasets [27, 45, 48, 56] (9.1%) used a combined retrospective and prospective methodology. The majority of the datasets, 72.7%, described hospital populations, while the remaining 27.3% described both hospital and community populations. Many of the studies reported the maternal mortality rate and perinatal mortality rate from their audited populations, and these varied between studies. Just under half of the studies (47.7%) estimated the percentage of deaths that were thought to be avoidable in the sample audited, and this ranged from 1.5% to 88%. Quality scores for the audits ranged between 2–8 (See Table 1). Overall there were 42 avoidable factors in maternal and perinatal deaths identified from the 44 datasets. These 42 factors fell into four general categories: health worker-oriented factors were the most common, accounting for 28 (66.7%) of the 42 factors; the next most common, in descending order of frequency, were patient-oriented factors (14.3%), administrative/supply factors (11.9%), and transport/referral factors (7.1%). All of the factors are summarized by category in Table 2 (within each category, factors are listed in order of relative number of attributable deaths). The top 10 avoidable factors, listed in order of attributable deaths, are shown in Table 3. The number of deaths attributable to these factors ranged between 251 – 688 of the total sample of 6,205 audited deaths. Each of the top 10 avoidable factors was reported in a maternal or perinatal death in 10 – 23 (22.7% - 52.3%) of the datasets. The most common factors reported overall were patient and transport delays, each of which was a reported factor in 52.3% of the datasets. Health care worker-oriented factors were the most common category of factors among the top 10 factors, accounting for six out of ten factors. Substandard health worker practice was responsible for the most deaths (688 deaths), and we estimated that this factor contributed to 28.5% of the deaths in datasets where it was identified as an avoidable factor (See Additional file 2). To our knowledge, this is the first systematic review of avoidable factors in global maternal and perinatal deaths identified by mortality audits. Numerous avoidable factors were identified and found to be related to the behaviors and practices of both health workers and patients, as well as to administrative, supply, referral and transport problems. Chronologically, factors took place across the continuum of childbirth from the antenatal period, through labor and delivery, and into the postpartum and postnatal periods, though the majority of factors were clustered in the intrapartum period. The most important avoidable factor by attributable deaths was substandard practice by health workers. While it would have been beneficial for audits to describe more precisely the specific substandard practices, there remains value in knowing that the majority of deaths were thought to have been avoidable if health workers performed better. This has implications for current strategies focused on assuring the presence of skilled health workers at every delivery, including campaigns that incentivize women to deliver in health facilities [63–66]. Our data are consistent with the idea that the presence of health workers at deliveries does not alone ensure the safe care of women and newborns. Adequate health worker training is vital and, presumably, so too are refresher courses and patient safety and quality initiatives that help to ensure that minimum standards of care are reliably delivered by health workers at each and every birth. While the audits specifically refer to substandard health worker practice, future work might include efforts to better understand how health care workers are supported or disempowered by the larger health system. The second most important avoidable factor by attributable deaths was patient delay. Cultural issues and failure by women and their communities to recognize danger signs proved to be significant factors in maternal and perinatal deaths. Detailed descriptions of the specific reasons for patient delay in the studies included delays due to decision-making control by the ‘head of household,’ childcare concerns for other children in the family, mistrust of the health system, and peer pressure by other members of the community. The data suggest that education in the antenatal period should not be reserved for women alone, but also made available to other members of her family and even the community-at-large, parties which may exert influence over the timing of the woman’s presentation to skilled care. This is supported by a recent study in Kenya that also found strong a strong link between women’s structure of social support and likelihood of institutional delivery . The third most important avoidable factor by attributable deaths related to blood transfusion capacity. Specific reasons cited included lack of accessibility to a blood bank, lack of materials for blood collection, blood safety concerns, recruitment of donors, and lack of infrastructure. One typical example of limited blood transfusion capacity was noted in the study by Adetoro , in which it was described how the blood bank at their hospital is open only for 8 hours daily. At all other times, blood must be retrieved from the blood bank of a larger hospital, located 4 kilometers away. Not only was distance an issue, but the authors also found that the larger hospital’s blood bank frequently suffered a lack of blood supply, and husbands and other relatives were unwilling to donate blood when asked. The main limitation of this systematic review derives from limitations of the individual audits. As mentioned above, the assessment of avoidable factors in many cases would have benefited from a greater degree of granularity. For instance, factors such as “substandard health worker practice” and “poor antenatal care” provide a broad orientation to where deficiencies in care occur, but greater specificity (e.g., what specific substandard heath worker practice took place? Why was antenatal care poor?) would provide more precise direction in order to successfully inform health solutions that target existing gaps in the health care system. Therefore, while the quantitative analyses presented are useful for helping to appreciate the relative frequencies with which avoidable factors were reported, the results of this study may have greater qualitative value through the description of where and when preventable deficiencies in care were reported to have occurred. A second limitation was the lack of standardized audit forms used in the different studies included in this analysis. Only 25 studies used a standardized form within their own study and none of these were identical between studies. This likely resulted in differences regarding how factors were both identified and labeled. A third limitation is that the analysis was limited to published datasets in the medical literature. As a result, the sample of deaths audited was not random. The majority of the datasets included were from Africa, and data were not weighted based on population size. Finally, a limitation of this review is the number of datasets included. While the number of datasets identified was robust on an absolute scale, we were surprised that more did not exist given that the inclusion criteria were liberal in terms of study date (1965 onwards) and geography (any low- and lower-middle income country). Audits are a proven method for helping to improve quality of care relating to childbirth , and some countries, such as South Africa in particular, have taken pioneering efforts to incorporate audits into the national healthcare system [12, 13, 18]. The findings of this review that relatively so few audits are being conducted (or, at least, reported) globally could constitute a call to action for stakeholders to initiate mortality audit programs, particularly in settings where rates of maternal and perinatal deaths are high. Audit processes highlight precisely where breakdowns in clinical care occur and are an established method for facilitating quality improvement in health systems. Through a systematic review of avoidable factors in maternal and perinatal mortality we are able to identify the specific timing and nature of factors that are reported to be associated with severe childbirth-related harm in low resource settings. These data can be used to inform the development of health system improvements that specifically target known deficiencies in care, which represents a rational approach for measurably improving health and achieving progress towards Millennium Development Goals Four and Five. The authors thank Grace Galvin (Harvard School of Public Health) and Paul Bain (Countway Library, Harvard Medical School) for their assistance with developing the search strategy and obtaining the articles to be reviewed. HSM participated in developing the project, reviewed all of the manuscripts included in this study, carried out the data collection, and wrote the first version of the manuscript. SL and NH participated in developing the project, performed all of the statistical analysis, and wrote the statistical analysis section of the manuscript. AL, PA, and AAG participated in developing the project. JS participated in developing the project, reviewed all of the manuscripts included in this study, carried out the data collection, participated in writing the first version of the manuscript, and was responsible for coordinating the entire project. All authors read and approved the final manuscript.